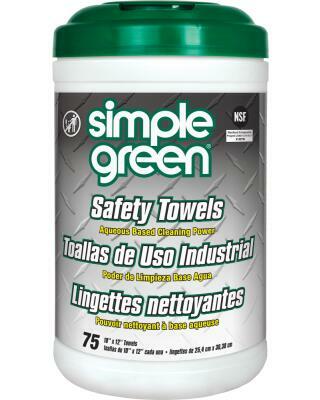 Simple Green Safety Towels are larger-sized wipes for heavy-duty, multi-purpose cleaning. They are pre-moistened with Crystal Simple Green, a powerful cleaner and degreaser that is both non-toxic and biodegradable. The durable, dual-sided wipes feature a scouring side for tough scrubbing and a smooth side for a non-abrasive shine. The wipes feature excellent wicking and fluid holding capacity for cleaning liquid spills and are thermally bonded and melt-blown to ensure durability and resistance to rot and mildew. Easily remove grease, oil, food spills, wet paint, carbon, graphite, tar, soot, grime, most inks and more. They are safe for use on all washable surfaces including metals, concrete, rubber, finished wood, tile, laminates, concrete, stone, porcelain, carpets and other industrial surfaces. The cleaning solution contains no added color or scent and is NSF registered for use in food processing facilities and commercial kitchens. Simple Green Safety Towels are dual-sided wipes that can cut through grease, grime and residue on equipment, machinery and manufactured parts. They are also NSF registered for use in food processing facilities and commercial kitchens.